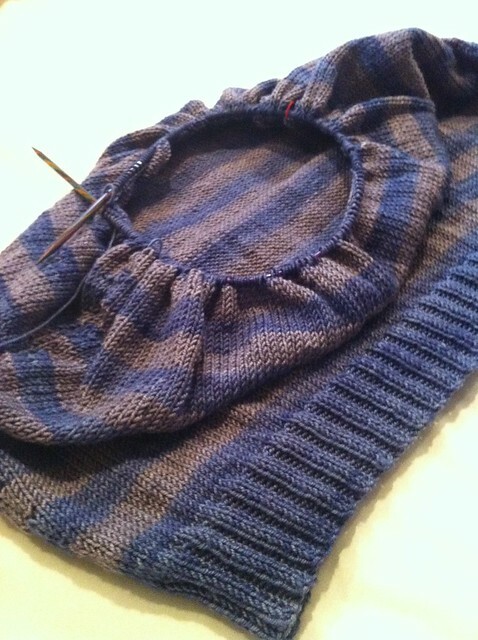 TT&T KAL: Roxborough Dolman…half way home! We are well into the luvinthemommyhood summer Tops, Tanks and Tees Knit Along and I am knit knit knitting along! Frighteningly there are some amazing people that have finished their garment….and some are even considering knitting a second. Phew, where do they find the time? I have made significantly less progress than a completed garment! Now, don’t be thinking that I have been slacking off. I think I have knitted every day in the last two weeks, it’s just that the knitting has been (mostly) confined to a few hours each evening. I am working in the round and this garment has some serious positive ease. I started off with 220 stitches and am well on my way to increasing up to 312 stitches….there are just a mere 40 rows to go before I can start thinking about dividing for the armholes and top section. I’ve worked out that I have about 17 stripes to do before I am ready for the armholes and neckband (which means that I am almost half way there). Each stripe is taking up to an hour and a half so by my calculations I have about 25 hours of stocking stitch to go….I so wish I hadn’t just worked that out!!! I just love this – might just have to make something striped with these yarns for myself – they look fantastic! Whew, 312 stitches, I feel with you. Don’t panic, suddenly you will be at the end spurt. Good luck and well done, I think it looks marvelous! Definitely not enough time for a second item!! You know what, I have not worn stripes for years (not good with a larger chest) but I seem to be obsessed with them at the moment…they seem to be creeping into my wardrobe without me noticing! This is why I don’t do math. 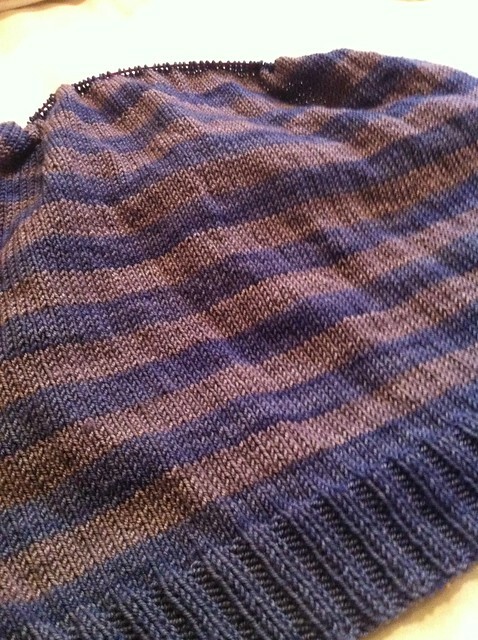 I would be so defeated if I figured out I had 25 more hours just of stocking stitch, let alone the rest of the sweater. But it will definitely be worth it, because it’s gorgeous! Yeah, it was a scary moment when I worked that out!